NEW YORK, 1937. Determined to make it among the hustlers, hucksters, and heroes of a radical new art form, Billy Eyron, a junior staff artist, begins drawing and creating comics. 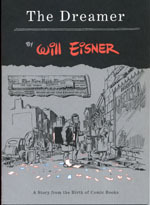 Based loosely on the early years of Will Eisner's own career, The Dreamer is a remarkable tale of grit and determination, as well a unique look at how comics got their start. In his own shop, Eisner trained several of the finest talents ever to draw and write comics-legends like Bob Kane and Jack Kirby- and a special annotations in this edition reveal the inspiration for the pioneering artists who appear in this book under pseudonyms. The Dreamer perhaps one of Eisner's greatest autobiographical works, also provides a wonderful introduction to the history of his true American art form.